Fourth and fifth graders who want to ski or snowboard are fortunate especially if they live in or near Pennsylvania. For the fourteenth year, the Pennsylvania Ski Areas Association (PSAA) is making skiing or snowboarding free through their Snowpass program for youths in those two grade levels. The Snowpass allows fourth and fifth graders to hit the slopes free, up to three times at each participating resort, when accompanied by a paying adult. Additionally, fourth and fifth graders can take advantage of a beginner lift, lesson, and rental package free and 50% off a beginner lift, lesson and rental package for the accompanying adult. 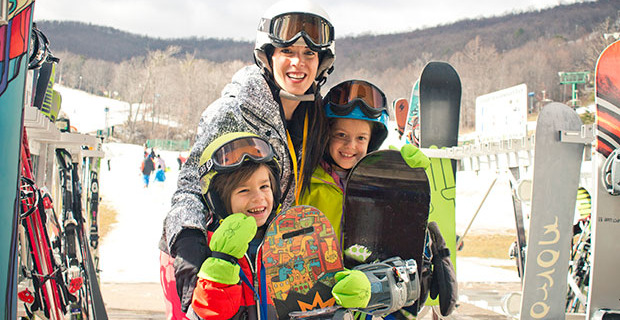 Skiing and snowboarding offers families the opportunity to exercise outside together during the winter months. A ninety pound youth can burn between two and three hundred calories per hour skiing and / or snowboarding depending on their activity level. Skiing and snowboarding are listed among the activities included in the President’s Challenge organized by the President’s Council on Fitness, Sports and Nutrition. Children and adults can earn points toward a Presidential Active Lifestyle Award by skiing and snowboarding. Nineteen ski/snowboard resorts across Pennsylvania belong to the Snowpass program. The Snowpass is not restricted to residents of Pennsylvania. Any fourth or fifth grade student can participate by completing a simple application and providing a report card or other document verifying they are currently in the fourth or fifth grade. A photo of the student is also required. You can apply online at www.skipa.com or download an application and apply by mail. There is a nominal administration / processing fee of $35 prior to December 1 and $40 after. Quantities are limited. Snowpasses are issued on a first come, first serve basis. Details of the program including rules and black-out dates can be found on the website www.skipa.com. The site lists all resorts in Pennsylvania and answers most frequently asked questions.